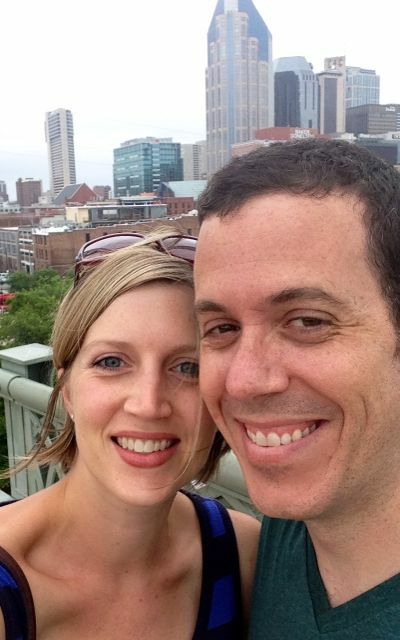 During my self-imposed blogging hiatus, Pat and I went to Nashville for a weekend. 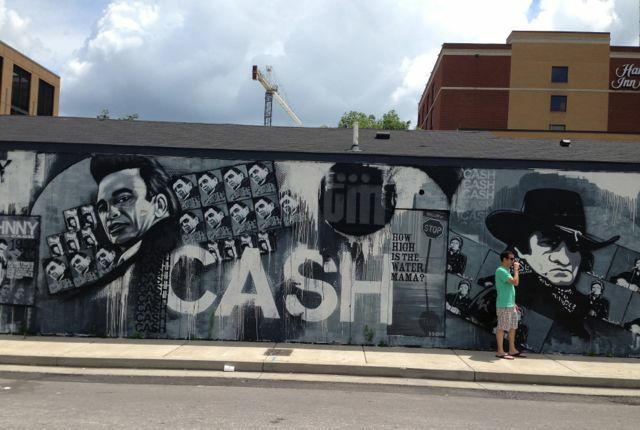 It’s old news now, but I decided to write about it both to share tips with anyone considering a trip to Nashville AND to remind myself that we actually went there. After all, if two people go on vacation but nobody blogs about it, did it actually happen? Here’s the post. July 16 marked my one-year anniversary of being unemployed. The one-year anniversary of staying home with the kids. It was also marked one year since Pat and I had taken our last child-free vacation. One year in, I’m still struggling with the whole work/stay home thing. I said I was going to give it a year, and I did. Now what? Those answers are complicated and I’m still working on them. What was not so complicated? That it was time for another vacation without the kids. It just so happened that Kelly, our former nanny (by whose departure I was so devastated, I barely wrote anything about our last child-free trip to Charleston) was available and willing to watch the kids for another long weekend. We had two days. We had some Hyatt points left over from my days of being a business traveler. What to do? We decided on Nashville. Neither of us had ever been there. It was a short, direct Southwest flight away. They had a Hyatt Place downtown where I could use my points. Pat and I are both big music fans, and, ahem, not-so-secret fans of the super soapy but entertaining show named after the city. We didn’t know much about Nashville, but we weren’t too concerned. When you get a weekend without kids, everything is exciting. Seriously, we were going through security at the airport, and I was so thrilled to be responsible for just me – not folding up a stroller and trying to keep Rory from photo-bombing the body scanner while the TSA tested his water cup for explosives and deemed my string cheese a “liquid” – that I couldn’t stop looking around with this dumb smile and glazed look saying “Isn’t this fantastic?” which is probably the only time the TSA has ever heard those words. Between our time constraints and limited transportation (we didn’t rent a car), we didn’t get to see everything we planned, but we had some good finds. Here’s the rundown. 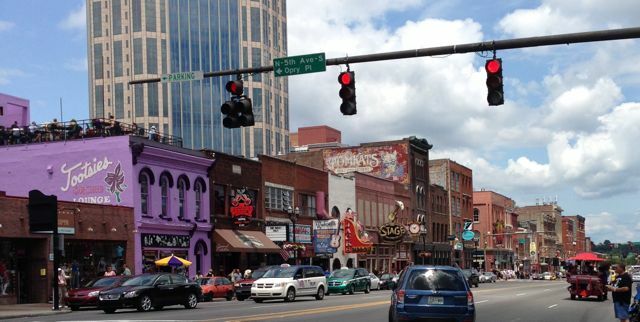 Our hotel was really close to Lower Broadway, with its strip of legendary Honky Tonks that people probably think of when they think of Nashville. Overall, we found this strip a little too touristy. The sidewalks were packed with bachelorette parties and packs of dudes looking to get lucky. That said, we had to see it once, and there were some highlights. 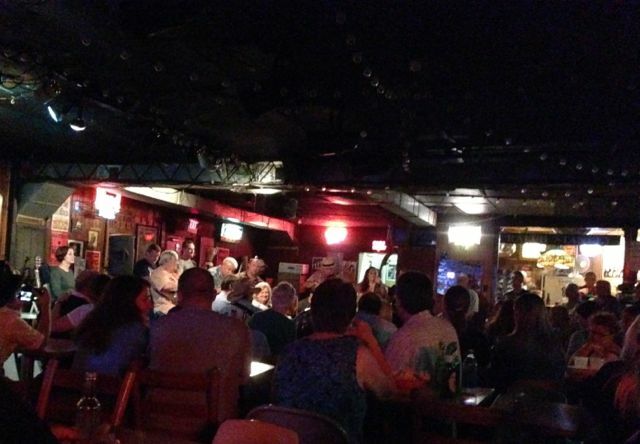 We had a beer and heard a cover band whose singer sounded just like Patsy Cline at Robert’s Western World. We wandered for an hour in a fantastic record store where I went crazy over the old album covers, but ultimately bought nothing. 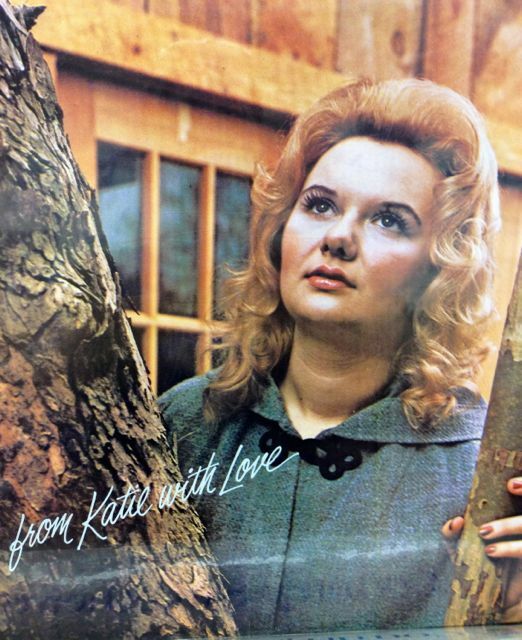 Who wouldn’t buy this record? We had heard good things about the Country Music Hall of Fame, but ultimately decided on the Johnny Cash Museum, both because we’re Johnny fans and because it was significantly less expensive. The museum was nice – a modern, intimate space with tons of personal artifacts – but it was also incredibly crowded when we were there, which made it harder to browse leisurely. Even still, we were glad we saw it. Saturday night, we cabbed over the river to East Nashville, which several people had recommended. Our first stop was a vegetarian restaurant called The Wild Cow (Pat first called it “The Mad Cow,” which sounded much less appetizing). There was a 20 minute wait for a table, so we ran across the street for a margarita. And missed our table. But it didn’t matter, because we were on vacation, there were no kids to get home to or wake up for, and we had a good margarita in us. So we waited a little longer for the table, and it was worth it. We both had tacos – Pat had the peanut tempeh and I had the chipotle seitan – and they were amazing. The Wild Cow. Pat loves when I take pictures of him eating. The plan for after dinner was to go around the corner to the Nashville location of Jeni’s Splendid Ice Cream, my old Columbus work trip standby. (I’ve since discovered that Jeni’s also has expanded to Chicago, Charleston and my local Target in the form of $9.99 pints.) Unfortunately, the line was out the door, and we were so full from dinner anyway, we decided to skip it. Instead, we walked about a mile through a really cute East Nashville neighborhood that, for those of you who also watch the show, is likely where Deacon, Scarlett and any of the other non-millionaires on the show are supposed to live. We ended up at a smoky, crowded place called 3 Crow Bar that reminded me of places we went in Chicago when we were first dating. Now we were probably the oldest and definitely the most sober people in the bar. “Is this the line-up?” one wobbly girl asked me as I waited for the bathroom. We sat at the bar and had two beers each before the smoke got to be too much. We left at 11, had the cab drop us in front of Mike’s Ice Cream and walked back to the hotel where we watched “The Internship” on HBO. Just a little different than those early-20s Chicago bar days. Sunday we slept in until some ridiculous hour (okay, 9:30, so we could make it down in time for the free breakfast) and then headed out for a run. It was cloudy and humid and though I was certainly feeling much better than the “Is this the line-up” girl at 3 Crow Bar, I wasn’t necessarily in top form. It didn’t help that we had no idea where we were going. 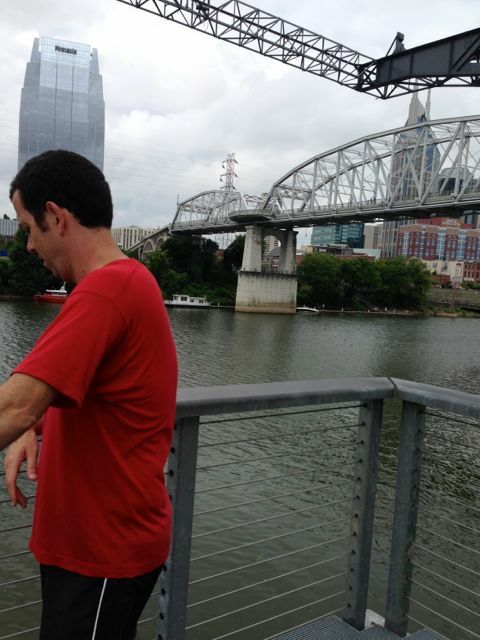 Pat and I ran over the river on the very cool pedestrian bridge, but then ended up kind of circling the parking lot of LP Field (where the Tennessee Titans play) and a small park next to it in an unsuccessful attempt to find a path. On the upside, we did see a barge come down the river, which we are both nerdy enough to think was pretty cool. After our run we went back to the hotel to get ready for brunch. 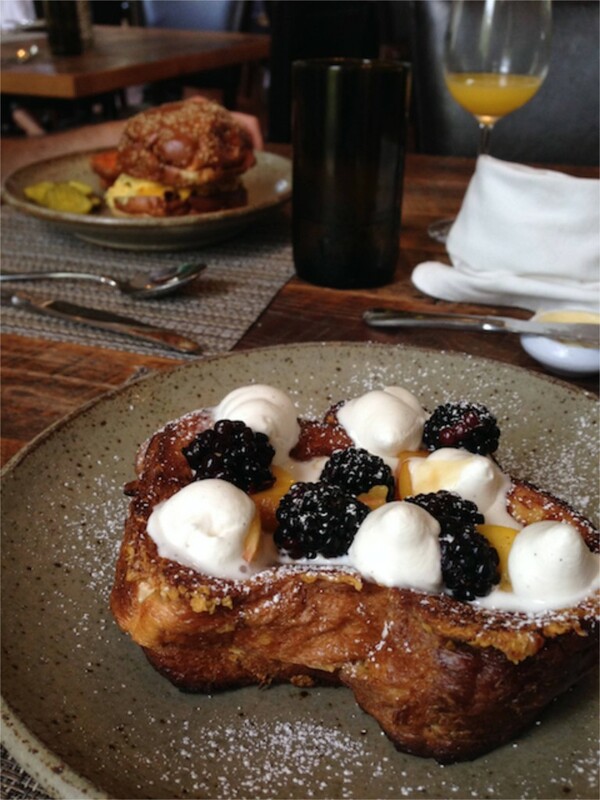 Brunch was the one thing I had made reservations for, because it was at Husk. Husk was little less than a mile from our hotel in a somewhat isolated neighborhood called Rutledge Hill. We were still hot from the run, it was high noon and humid, and Pat and I were both sweating bullets by the time we got there. It was worth it. We were seated in a room decorated very similarly to the restaurant in Charleston. We ordered mimosas. I would have ordered everything on the menu, but I “limited myself” to these hush puppy things and deviled eggs and this insane peanut butter stuffed French Toast. Pat had the hamburger. We worked off our brunch by walking back across downtown to the Tennessee Museum, a history museum that started in the basement of a concrete public building and continued to descend into multiple sub-basements. It was nothing flashy, but it was free, air-conditioned, and interesting, if you’re into that kind of thing. A sneak peak of the portrait Pat and I commissioned for our 10th wedding anniversary. 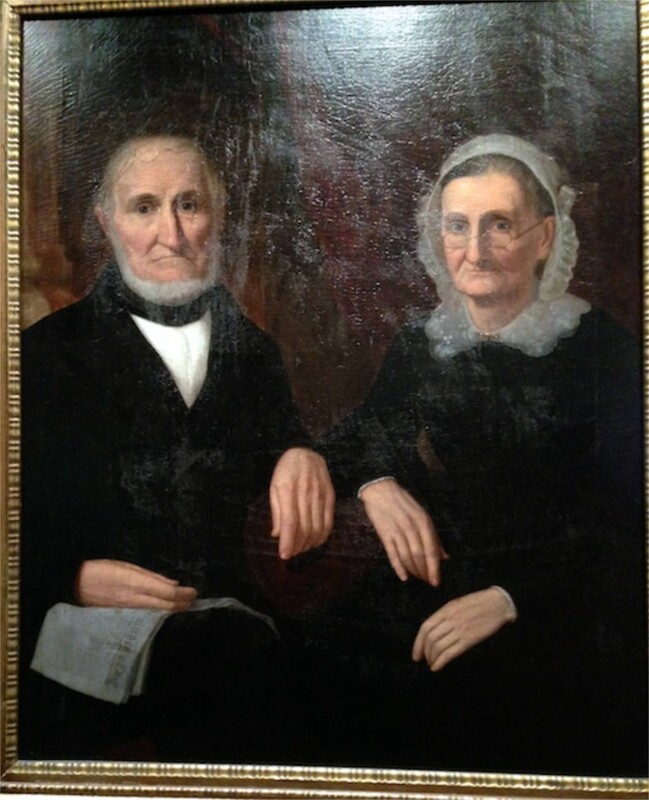 As Pat and I stood discussing and making lame jokes about a series of 19th century portraits, I couldn’t help but think how I had lucked out marrying a guy who was almost as into dusty museum stuff as me. After the museum, we were ready to hear some music and have a beer. 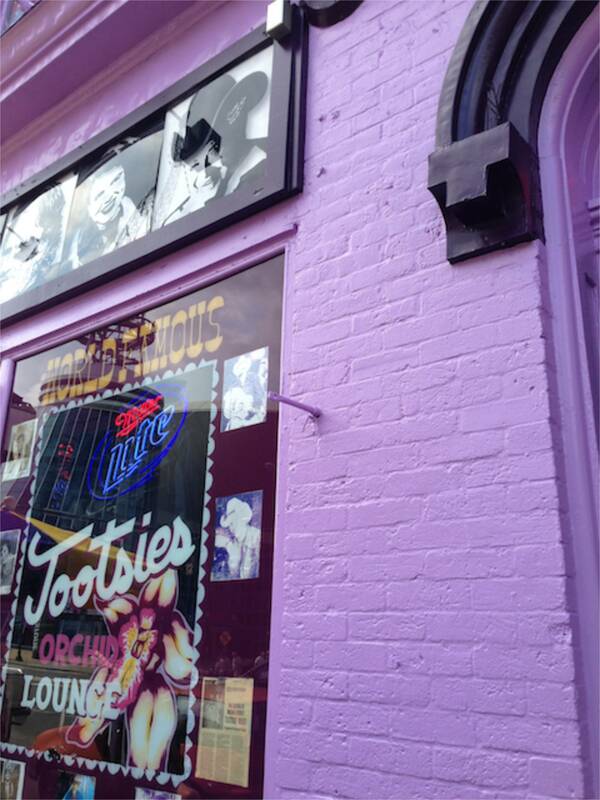 We headed to Tootsie’s Orchid Lounge, one of the more notable venues on Lower Broadway. A band was playing upstairs. We got a beer and sat at the bar. And then I had a really embarrassing moment that probably got me banned from Nashville for life. The crowd was pretty thin, but when the band started a cover of “Redneck Woman,” an enthusiastic group of girls who looked like a lot of girls we saw on Lower Broadway – deeply tanned blondes in cheek-grazing cutoff shorts, cowboy boots, shredded and/or rhinestoned American flag tank tops – jumped up to dance. They sang every word of the song along with the band’s female singer. So it was a mystery as to why – dear God, why? – the singer felt compelled to wander with her wireless mic through that crowd over to the bar where I was primly sitting in my Target sundress and sandals. But she did. And at the chorus – or bridge – I have no idea – she stuck the mic in my face. Nashville fail, ladies and gentleman. She went back to the stage and made a joke about how she’d come back to me later, once I had a few more drinks in me. Of course she didn’t know that it had nothing to do with liquid courage; she wasn’t there when I sang Bon Jovi at live-band karaoke at my client’s big sales meeting when I was six months pregnant with Rory and stone-sober. But she didn’t have to. We hightailed it out of Tootsie’s as soon as we finished our beer before she could make good on her promise. We were uncertain about what to do with our last night. 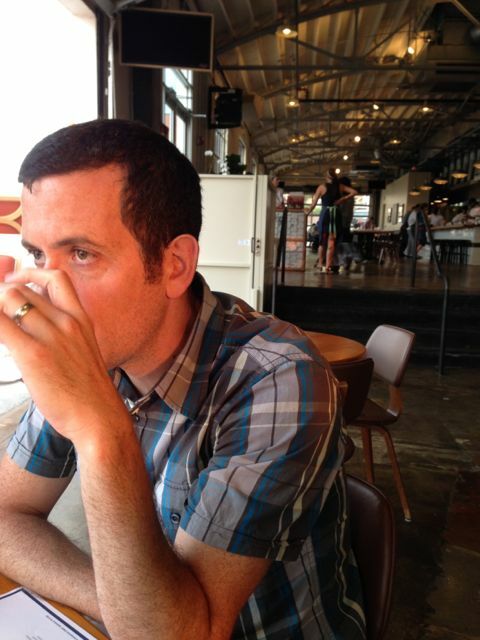 Take a cab back to East Nashville? Or out to the The Bluebird – where, among others, the actor who plays Deacon on Nashville was playing – and hope to get seated? Instead, we decided to take a walk down to The Gulch, an area which, based on all the construction, is either pretty established or quickly up-and-coming. It was a pretty long walk (with all the walking we did, I never wore any of the cute “vacation” wedges I had packed), but a nice one. 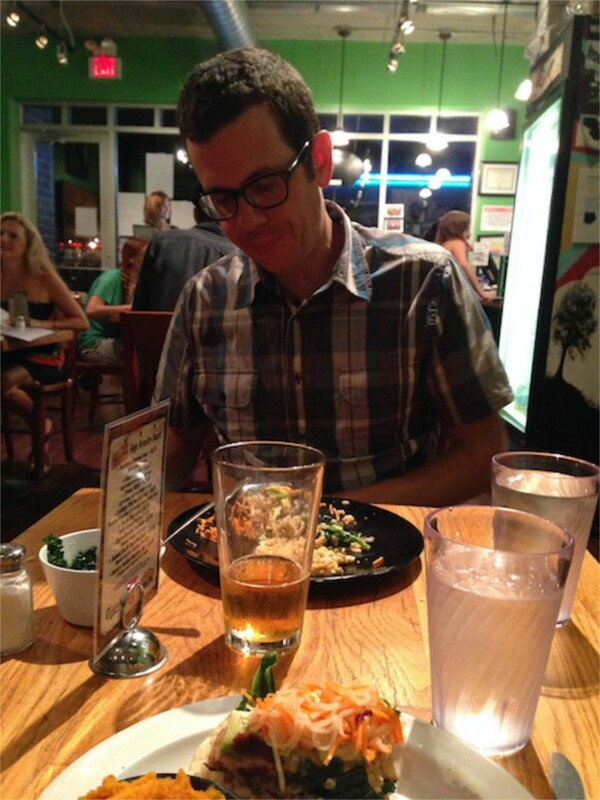 We chose a fairly new restaurant, Adele’s, that had a great vibe and equally tasty food. 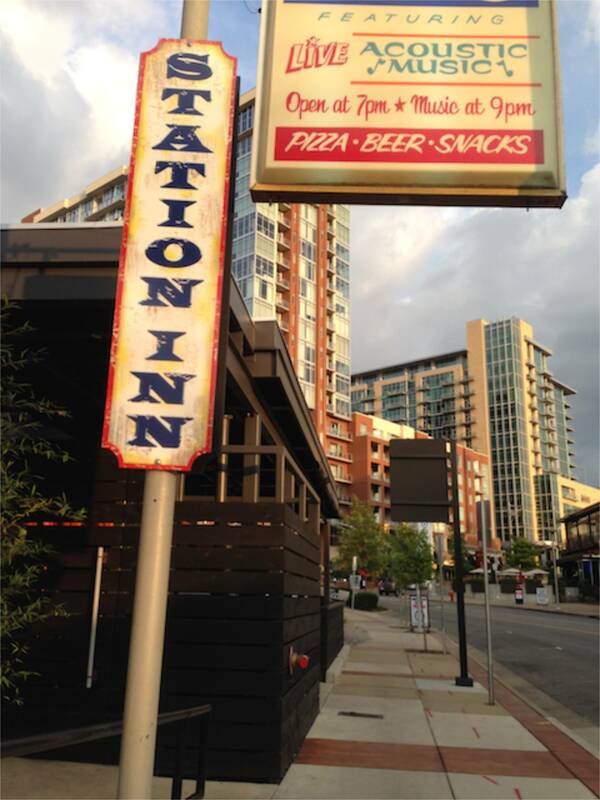 Then we headed to our main reason for choosing The Gulch: The Station Inn. 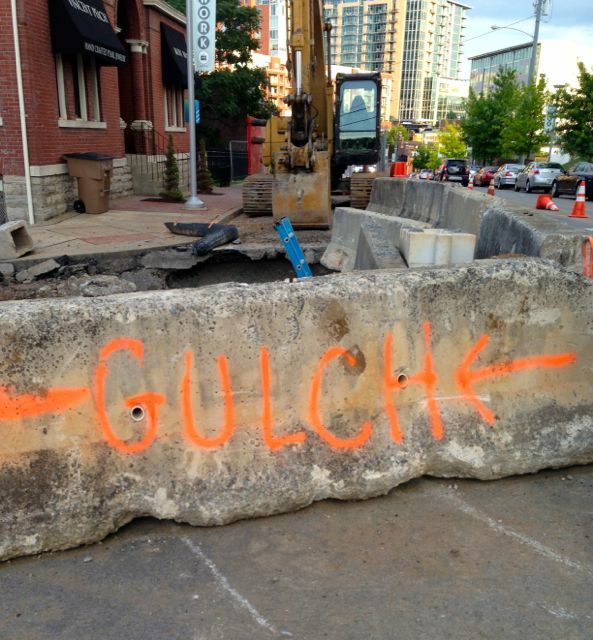 The small, un-fancy bar sticks out like a sore thumb in the midst of all the Gulch’s new construction. Or should I say the new construction sticks out like a sore hand around a venerable old thumb, because Station Inn has been an institution in country music for decades. We were especially interested in seeing the Sunday night bluegrass jam, which anyone with an instrument can participate in. It didn’t disappoint. The room was packed. Pat and I got a pitcher of beer and found two seats on the stage behind where the musicians sat in a circle two rows deep. The musicians were a great mix of old-timers, young hipsters and even a few kids who couldn’t have been out of high school yet. Later in the show, four younger guys sat down and joined the group. The way they were singing and playing made it obvious that they played together outside the jam, and Pat quickly identified them as The Dirty Beggars, a group that had played at The Bluebird earlier that night. Then we heard them speak, and realized they were Scottish. “Oh, all of them,” he said. We had only one goal for before we left Monday morning: to hit a donut place called Peace, Love & Little Donuts. Three things I’m a big fan of. What could this go wrong? I think it’s fair to say I’ve rarely met a donut I didn’t like. But these were pretty disappointing. 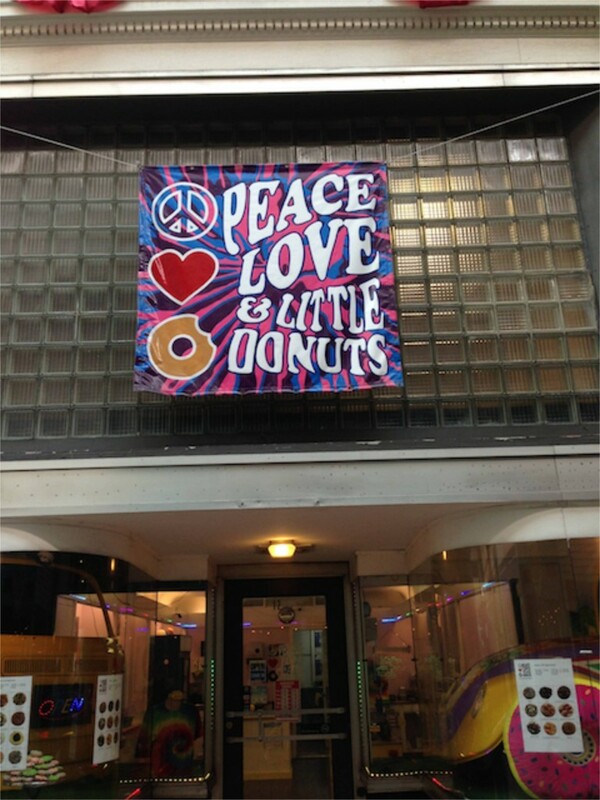 The concept was sort of a create-your-own mini donut, and I guess I’m spoiled by all the amazing donut places around Durham, but I just wasn’t that impressed with the outcome. As we gathered up our things to check-out of the hotel, we actually ended up throwing two of them away. And guys, I don’t throw donuts away. Ever. It was an inauspicious ending to an otherwise fun weekend. 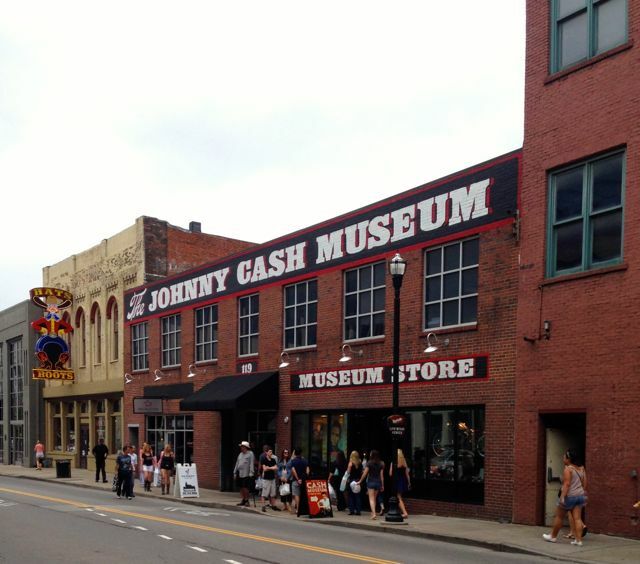 The Nashville we saw was an interesting place – a mix of old and new, touristy and authentic, delicious and mundane. I don’t know that we’d rush back there for another weekend away, but I’m glad we saw it once, and I’d be happy to go again if we had the chance. More importantly, Pat and I have decided that we should try to do a weekend getaway every year, to keep exploring new places and giving ourselves little reminders of what life was like before kids. And it’s never to early to start daydreaming about it. 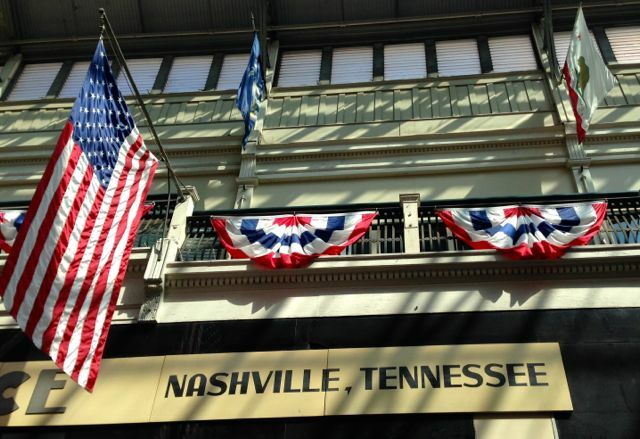 So: what did we miss in Nashville? And where should we go in 2015? We’re going to Nashville in Oct for our anniversary so thanks for this, I’m taking notes! Oh fun! That should be a pretty time of year there. Have a great trip! You definitely need a couples weekend getaway every year. My parents always did once a year for their anniversary and insisted my sisters and I did it too. Also they did monthly dates, sometimes money was really tight and date night was sharing and ice cream cone and sitting in the park chatting because they couldn’t afford a dinner out while we played at a friends house too. But it is nice to relive those carefree days with out kids and spend a few quality moments with the love of your life. Maybe next year Boston… a beer at Cheers… lot of historical places to visit. Don’t know where they have good music but I’m sure some body at Cheers would know or you could always just belt out a Bon Jovi tune huh?